Mmm, much is often diagnosed as "Mycobacterial" in origin. Like most infectious issues, those attributed to TB are largely environmentally mediated. Nonetheless, do wear gloves and/or keep your hands out of your tanks if your skin is broken. so this is exactly the kind of thing that interests me and therefore I have collected a lot of information about the circumstances. In the tank resides one female crayfish of unknown species and two "mosquito fish" (Gambusia affinis). I have had the crayfish since November 2, 2015 when I accidentally caught her from a pond at my school (I was netting some mosquito fish from the pond to put in an aquarium because I'm just weird like that). She was only approximately an inch long at the time, and almost translucent, with tiny little baby pincers. While reading up on crayfish, I found a recipe for a gel-type food that I could adjust to meet her needs. It uses gelatin as a binder, and is frozen after it sets, so I can break off cubes to thaw as needed. I made it with dried Spirulina, dried organic kelp, fresh spinach, fresh zucchini, cooked whole shrimp, and some salmon. It is mostly greens, though, as that seemed most appropriate. Her diet consists of the gel food, shrimp pellets, algae pellets, fresh greens/cucumber/etc., duckweed, and sometimes frozen brine shrimp. I try to keep it varied. Now she is approximately 4.5" long, and has molted 10 times since I brought her home. The problem started with the last molt, which was July 15, and continued with one that happened 5 days ago. Before I get to that, however, I want to express my reason for emailing you when you have so many posts already regarding bad molts. I had some mosquito fish fry in my 5.5 gallon aquarium, and on June 5th I noticed one fry had a bent spine. I thought maybe he had been injured or something, and never considered that it could be something contagious. Then there were some other anomalies with the fish in that tank and with the tank conditions, the specifics of which probably don't matter in this context. But at some point I realized there were more than one fry with a bent spine, and finally researched it as a symptom of a larger illness, rather than an injury. I began to come to the horrible hypothesis that my tank somehow had been infected with mycobacterium. It explained many of the abnormalities I had encountered. I tried treating the 5.5 gallon with Tetra Lifeguard (it's the only medication I had on hand so I gave it a try), which was ineffective against most of the symptoms I was seeing. The number of fish with spinal deformities was going up, and there were several deaths within a few days of each other, so I began to consider euthanizing them. Before I did, however, on July 15 the crayfish molted and was left with at least three exposed gills on one side. They were completely outside the carapace. I went to my LFS (they have a local reputation as "experts"), freaking out a bit, and the guy was worse than useless. He said he couldn't help me, there was nothing that could be done for either the crayfish or the Gambusia. His actual advice regarding the crayfish was, "just keep checking the water conditions and see if she makes it." I euthanized about 15 fish that day, mostly fry, and treated the healthiest ones with Kanamycin. I completely broke down my 5.5 gallon tank and tossed all the live plants, but didn't know what to do about the crayfish in the 10 gallon. I decided to just go on the assumption that crayfish couldn't contract mycobacterium (if that's even what my fish had, but I didn't test them, so I'm not 100% sure), and that the bad molt was due to lack of iodide, which she only really gets from her diet. The last few months she was pretty much refusing to eat the gel food any more and would just make a mess with it and then leave it sitting on the bottom of the tank. She stopped eating the stuff she usually enjoyed, like fresh kale, and would almost exclusively eat the shrimp pellets or the flake fish food that I put in for the mosquito fish. I kept meaning to buy aquarium iodide to supplement this, but life happened and I never got to it. I didn't realize how long she went without eating greens until I saw the effects. around a little and she is definitely alive and alert. She looks awful though. I have ordered marine iodide and I am keeping the tank somewhat dark, so she feels safe and hidden, to minimize stress. I bought gallons of bottled water and I **VERY** carefully gravel vacuumed the dirtiest part of the tank (I didn't clean the whole thing because, again, stress. I didn't go too close to the crayfish herself, I let her feel hidden.) and replaced the water (about 50% of the tank) with Crystal Geyser, instead of using treated tap water. I don't know why, it just seemed safer. Maybe that's just paranoia. My concern about getting her through this is, can this be caused by mycobacterium? It affects the skeletons of vertebrates, could it affect the exoskeleton of an invertebrate?? Should I take the exoskeleton out at this point? Is it just making water conditions worse as it breaks down? I adore this crayfish. She is a remarkable little creature. Can I do anything for her? Is there some medication that would help her recover? There are things I know I did wrong and will be making an effort to change, but I don't know enough about invertebrate biology to know exactly what went wrong, especially when there are a number of possible causes. I'm attaching a couple pictures of her current condition so you can see what exactly I'm talking about. Thank you in advance and let me know if there is more information you need. Sorry I forgot to attach the pictures when I emailed you earlier today. I was up late studying for finals so I'm a bit tired lol. Forgive the reflections off the glass of the tank. Also, I cropped the pictures to reduce their size, so some may be odd proportions. If there are any included here that look weird, they are included because they show something specific, like the gills outside the carapace (which are hard to see because they blend into the rocks) or the antenna that is sad looking. The redness of the claw is obvious, but also if you look closely you'll see the fuzziness... like it's rotting. All these are from the most recent molt that she had about 5 days ago. The first 2 pictures were taken 2 days after molting, the next one where she is on her side was taken yesterday, and you can see how the redness has spread down the claw. In that one she is next to her shed exoskeleton, so excuse any random extraneous body parts. Thank you again for all your time. This is very long because I want to give as much information as possible. I am a college student working on my B.S. in zoology, so this is exactly the kind of thing that interests me and therefore I have collected a lot of information about the circumstances. can break off cubes to thaw as needed. I made it with dried Spirulina, dried organic kelp, fresh spinach, fresh zucchini, cooked whole shrimp, and some salmon. It is mostly greens, though, as that seemed most appropriate. I had some mosquito fish fry in my 5.5 gallon aquarium, and on June 5th I noticed one fry had a bent spine. I thought maybe he had been injured or something, and never considered that it could be something contagious. Then there were some other anomalies with the fish in that tank and with the tank conditions, the specifics of which probably don't matter in this context. But at some point I realized there were more than one fry with a bent spine, and finally researched it as a symptom of a larger illness, rather than an injury. I began to come to the horrible hypothesis that my tank somehow had been infected with mycobacterium. It explained many of the abnormalities I had encountered. She molted 5 days ago and she almost died this time. I found her lying on her side next to her molted exoskeleton, and she had a number of gills outside the carapace again but more this time, and on both sides. One of her antennae didn't look right, and she was not moving. Her little antennules were twitching, though, so I covered the tank with a dark towel and kept her in the dark and quiet for about 24 hours before checking on her again. At that point she was still on her side, but another 12 hours later she was upright again and eating her exoskeleton. Now I have been able to see her better and not only are a bunch of gills outside her shell and an antenna bent (and the part after the "bend" is turning white), but one of her claws looks really bad, too. She was holding it funny and after a couple days the "elbow" (for lack of a better word) turned very bright red. The redness has spread along that claw and it also looks a little fuzzy, like food that's been left in the tank too long. She isn't very active, she is barely eating her exoskeleton at all, but she does walk around a little and she is definitely alive and alert. She looks awful though. It affects the skeletons of vertebrates, could it affect the exoskeleton of an invertebrate? Should I take the exoskeleton out at this point? Is it just making water conditions worse as it breaks down? I adore this crayfish. She is a remarkable little creature. Can I do anything for her? Is there some medication that would help her recover? attaching a couple pictures of her current condition so you can see what exactly I'm talking about. Thank you so much for all the information. As Neale observed, there is a lot more information available out there about exterminating inverts than saving them, so you guys are a rare and valuable resource. The crayfish lost her damaged claw the other day. Not just the part that's exoskeleton, either-- there was a good sized chunk of flesh that came off too. She has a little stump that is still bright red and white, and looks quite bad. She hides 24/7 (making it difficult for me to get a good look at her) and barely moves at all. She doesn't explore, or rearrange her tank, or scavenge for food at all. She hasn't been eating her exoskeleton, or anything else that I know of. I kind of gently nudge her tail sometimes just to see if she is still alive (she is). I'm very concerned. I removed from the tank the part of her dead claw that was fleshy, after a couple days, since it was beginning to decompose. I guess my big question is just... in your opinion(s), do you think she will make it? Obviously you can't predict the future (or can you?? o_0) but in your experience is something like this survivable? I'm hoping you can help me with a problem I've been having in my freshwater tank. I came home with a couple of new guppies in October and they had Camallanus worms. I ended up with my whole tank infected. After trying several things I was finally able to get my fish store (not the one that I bought the sick fish from) to sell me some Levamisole, which took care of the worms. Since they were treated the one neon I had developed a crooked back and died. I figured that he had worms inside him that died and that was why he got crooked and of course died. Could the crooked backs be related to the Camallanus worm infestation or is it probably fish TB. If it's TB do I just give up on the tank and the 20 or so fish in it? I'm new to your web page but have had a look at a lot of the info here.. I come with a pretty heavy heart as things are not looking good in my tank. Got 2 new dwarf gouramis 2 weeks ago. I didn't quarantine. I know, stupid. I don't have a quarantine tank. I've never had trouble of this sort before, and really only 'dabbled' in having fish. (I set it up, it worked, I cared for the water and the tank and all seemed good... Never needed to look further into it). all was ok for about a week until a Mollie died. I watched the tank and noticed a bit of aggression from one of the gouramis. I put the death down to this and hoped all would settle. A few days later, the guppies started dying one by one and I noticed one of the male's tail had a tear and a white/clear patch developing. 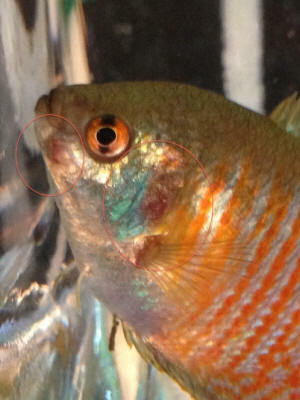 I also noticed at this stage a lesion on the face of one of the gouramis, and a 'graze' patch on the other one. I began treating with Melafix, but after a few days I realised the bottle I had was out of date. I went to the aquarium and got a new batch and some salt to add. The gourami with the 'graze' - the one who was initially a bit aggressive - got rapidly worse over 3 days. The graze patch spread across it's side, over it's head and onto the other side. I euthanised it yesterday. All of the guppies have died except for 1 male, who seemed fine until tonight - he has started swimming really limply and has a black spot in his dorsal fin. The most recent guppy to die (female) was badly emaciated. I called the aquarium and they said the MelaFix takes 7 days to work, but I can see the second gourami getting steadily worse. I have also called a vet, but need to wait about 14 hours before they would be available and they have told me it will cost upwards of AUD$290 to test and diagnose for Mycobacteria. Firstly I'm not sure if the fish will last this long, and secondly am not really in a position to spend this much. I'm concerned for my own health, as I most certainly have cleaned the tank in the last two weeks with broken skin on my hands. I've bought some shoulder length gloves online, but I am nervous at the thought of getting infected. I noticed a spot on my hand a few days ago (before I knew of Mycobacteria) that went away in 24 hours. I have taken a photo of the faded site. 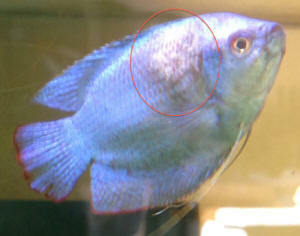 I include photos of the deceased gourami, the still-living gourami and my hand. Thanks in advance. I guess I know the chance of it being Mycobacteria is slim, but I can't get it out of my head. Thanks for being there to help with this kind of thing. I'm still a little in the dark as to how to proceed. I have read a lot of the info provided online and have gathered as such: Vet/pathological tests= expensive but worth knowing? Melafix = worthless. Change to antimicrobial medication (from the vet? Or do aquariums sell this? - it's nearly 2am here so can't check myself). This may help if it is NOT Mycobacterial. My hand = 'I am relieved', suggesting you think it is fine? From what I have read it starts as a spot and comes back up to 4 weeks later as a welt. Fingers crossed this is not the case. Tank maintenance = I have ordered gloves. Is this feasible as long term personal protection? Update: the second gourami has faded and I do not have faith it could have gotten better. It has been euthanised. I am very disappointed that the aquarium has urged me on two separate occasions to continue the MelaFix. My focus is now on the remainder of the tank. Is it viable to assume the best outcome and treat with antimicrobial meds? The vet I consulted yesterday told me that a live specimen is needed for diagnosis (and would be sacrificed for the samples to be taken). I have, however chilled the deceased gourami in case they tell me otherwise tomorrow. I have no idea about what this means for the future of the tank and my still living fish. Any further info you can supply would be greatly appreciated. I began treating with Melafix, but after a few days I realised the bottle I had was out of date. I went to the aquarium and got a new batch and some salt to add. All of the guppies have died except for 1 male, who seemed fine until tonight - he has started swimming really limply and has a black spot in his dorsal fin. The most recent guppy to die (female) was badly emaciated. I called the aquarium and they said the MelaFix takes 7 days to work, but I can see the second gourami getting steadily worse. I have also called a vet, but need to wait about 14 hours before they would be available and they have told me it will cost upwards of AUD$290 to test and diagnose for Mycobacteria. Firstly I'm not sure if the fish will last this long, and secondly am not really in a position to spend this much. I wanted to clarify something that has been bothering me for a while now. I believe, from reading posts and questions in various forums, that this subject is a general cause for concern, but the bottom-line is never truly addressed. As a laboratory professional, more specifically, a microbiologist, the topic of "fish tuberculosis" has naturally piqued my interest. Perhaps it's an unfortunate coincidence that the Mycobacterial disease in fish was coined "tuberculosis", although the actual microorganism that causes the disease is Mycobacterium marinum. The microorganism that causes the dreaded tuberculosis (the pulmonary disease) in humans is Mycobacterium tuberculosis. It is true that M. marinum can cause disease in humans, so I believe care should be taken, especially if a person is immunocompromised or has cuts or broken skin on their hands or arms. Usually, the infections are opportunistic and are skin-related diseases (granulomas). The pathogen that causes "fish tuberculosis" in fish does not cause tuberculosis, the pulmonary disease, in humans. I hope I haven't confused the situation more...in proof-reading I had to stop and think a second. Anyway, I don't want to downplay the dangers of M. marinum as the pathology it may cause in humans is nothing to ignore. I just wanted to clarify that "fish tuberculosis" is not the same as TB in humans. I also wanted to give a great big "Thank You" to all of you who help all of us on a daily basis! Your knowledge and experience benefit us all so much (well, I can only speak for myself...). Thanks!! <Depends again. Are any animals currently sick? When was the last death? the UV sterilizer is kind of a finishing touch, not a first line of defense. Shouldn't really need it at all, I just like the additional step. 2) What would the order of treatment be (in other words, which comes first -- UV Sterilizer, filter media change, antibiotics)? 3) Do you recommend a particular UV sterilizer? 4) Obviously, I am going to destroy my biological filter with all of this. How should I deal with that during treatment? Thanks again. I know I made a huge mistake not quarantining. My experience should serve as a cautionary tale. I would have avoided a lot of heartache if I had simply followed best practices. but if I could get one last clarification it would make me feel much better. I get so nervous before doing major stuff to the tank, I always fear I will make a huge mistake and kill everyone. The last death was yesterday. No one is sick right now. Does you still recommend the antibiotics, new media, uv sterilizer trio? <At this time, I would just change the filter media, do a major water change, and monitor the tank. At the very first indication of illness, start the antibiotic treatment. If you do have a UV sterilizer, you can put it in now and leave it in for several weeks, even if there are no obvious illnesses.. I don't know if the cost justifies buying a UV sterilizer just for this, but they are nice to have available as an option. Also, I have a 10-gallon QT set up for future new arrivals that I could put the loach in, however, I cycled it using filter media from the big tank. Should I treat the QT first, change the filter media in it and then put the loach there while I treat the big tank, or is the risk not so great that it makes a difference? Again, thank you so much. I will be making another donation to your wonderful site. Thank you again. I will update you in a few weeks. Happy autumn my wet web friends! Thank you as always for the wealth of information on your site. It is the only Internet resource I consult. My 72 gallon bowfront has been up and running for 7 months. I was a complete novice and utter fool when I got this tank, and did not quarantine new livestock. I also purchased 9 platies from a big box store soon after setting up the tank. Five died within a few weeks from what I believe was/is Mycobacteria. The ones that survived were doing okay, and had a number of fry that also survived, but a pattern soon developed where one of the males would start harassing one of the females, and a few days later, she would develop Mycobacteria symptoms and die. My belief is that when the fish was healthy, she could fend off the Mycobacteria, but as soon as she got stressed, it "got" her. <Not uncommon. There's definitely a lingering problem of some kind in your tank. At this point, only 1 of the original 9 is still alive, and 7 fry have reached maturity. I have 2 males and 6 females. I would like to get a few more females to spread the love, so to speak, and have found a LFS with good husbandry practices, but is doing so merely a death sentence for the new additions? I have read on your site that Mycobacteria is present in most all aquariums, but also read that a tank with a Mycobacteria outbreak should be broken down and bleached in order to avoid a recurrence. So, can I in good conscience add platies? Would Endler's be a better choice (and would the platy males be interested in them)? Or should I avoid livebearers all together? I am sorry that I didn't give you the necessary information in my first email. I have read so many FAQs I should have known better! The first few weeks I had the tank there were some water quality issues, including an ammonia and nitrite spike, because I didn't know about cycling. Since then (the last 6 months), ammonia=0, nitrite=0, nitrate= between 10 and 20. Also, it was at 77 degrees, 7.4 ph, KH=3, GH=6. When I began researching on WetWeb, I realized the platies need harder, alkaline water, so I began adding Neale's Rift Valley Cichlid mix (Epsom salt, marine salt, and baking soda) until now the KH=5, GH=between 200 and 220 ppm or between 11 and 12 gH degrees, Ph=7.6. The temp is set at 76.5, but during the summer months I couldn't keep it below 78 or 79. I do a 25% water change every week to 10 days. Platy #1 -- died within three days of entering the tank. Crashed on bottom for one night, localized swelling on one side with small amount of "white fuzz" on scales. Platy #2 -- A month after tank setup, crashed on bottom of tank, fins clamped, flashing. A few days later, internal red "blotch" visible. The next day, localized swelling at site of red "blotch," swimming erratically, laying on side, heavy breathing. Euthanized (using clove oil). Platy #3 -- One day after platy #2 died, crashed on bottom, flashing, fin clamping. Died days later. Platy #4 -- One month later, hiding, crashed on bottom, "sickly" color, day later dropsical. Died two days later. Platy #5 -- Two months after platy #4, platy harassed by male for several days. Started hiding, hanging at top for a few weeks. Stopped eating for four days, became dropsical and died the next day. Platy #6 -- Around same time, started hanging by filter for a few weeks. Developed dropsy. Euthanized the next day (a week after #5). Platy #7 -- Traditional "wasting away" became very skinny over the course of a month. Eyes became "sunken." Turned up dead in tank one morning, two weeks after #6. Platy #8 -- A month later, harassed by male for few weeks. Started hiding more. Developed slight localized swelling on one side and eyes appeared slightly "sunken." Began swimming erratically, crashed on bottom, laying on side, heavy breathing. Euthanized. As I said, the only other fatalities were two Rasboras. One had a large lesion develop on his side and he got quite skinny before he died. The other had a large white lump appear under the skin near his tail. 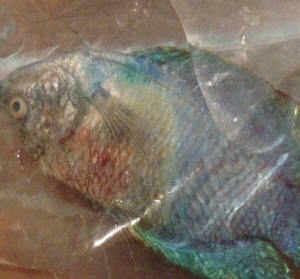 He developed fin rot and died despite antibiotic treatment in a hospital tank. I have concluded that this is some sort of Mycobacteria because it appears to affect only the platies, and, honestly, after hours of research I don't know what else it could possibly be. I am completely open to suggestions as I very much want to correct the problem. All of these platies came from a store where, in my visits since, I have seen many fish with clamped fins, dead fish left in tanks, and other indicia of poor fishkeeping. Also, I am quite sure they were farmed platies, so they may be genetically weak as well. <Well, almost certainly they were farmed. But chances are it's some kind of gram negative bacteria. Mycobacterial infections are somewhat rare See this article. Discussion of Mycobacteria can be found but searching the document for "tuber" as in tuberculosis. The entire article is worth reading. I very much appreciate any and all thoughts you might have. I am still trying to make up for initial mistakes, and want to make a healthy tank for all inhabitants. Thank you again. Enjoy the last day of summer! With a lingering problem like this, you want to treat the fishes, you want to get any lingering bacteria out of the water with major water changes (preferably before you add the meds) and completely replace the filter media, since the nasty bacteria can hide in there just as easily as the beneficial bacteria. I bought myself a modest UV sterilizer that I use in this sort of situation. I install it in the tank and leave it running for several weeks. When I'm confident the situation is corrected, I remove the UV sterilizer from the tank and store it. That kills free bacteria in the water. You also want to use medicated food if possible. I wrote to you several weeks ago as a "newbie" who had completely botched the transfer of a friend's 72-gallon tank. Since then, I have learned more about water chemistry and fish behavior from reading your website than I ever thought possible, so thank you. Unfortunately, I am humbly seeking your advice once again, but this time because after much research I am considering drastic measures in an attempt to curb what I fear is an outbreak of Mycobacteria infections in my platies. Here are the relevant stats: 72-gallon tank, inhabitants are: 6 platies (plus 2 platy fry), 9 zebra danios, 5 neon tetras, 2 harlequin Rasboras, 1 common Pleco, and 1 kuhlii loach. The tank was transferred from a friend's house to mine six weeks ago. As a result of initial ignorance, we had a mini-cycle and a nitrite spike (to about .5) within the first week. Since then, ammonia and nitrite have been zero, nitrate never higher than 20ppm, and ph hovering around 7.4. Last week, I finally got my GH/KH testing kit and discovered that despite the ph, my water is soft out of the tap (KH = 3 degrees dh and GH = 5 degrees dh). I started adding Neale's Rift Valley Salt Mix during water changes at about 1/4 strength to slowly harden the water and the tank is now at KH = 4 and GH = 6. I know that is too soft for the Platies, my goal is KH of 5 and GH of 11 (I don't want to go too hard b/c of the neons and the loach). Platy #1 -- died on 2/16 within three days of entering the tank. Crashed on bottom for one night, localized swelling on one side with small amount of "white fuzz" on scales. Platy #2 -- crashed on bottom of tank, fins clamped, on 3/10, coming up only to eat and occasionally flash. Three days later, internal red "blotch" visible. The next day, localized swelling at site of red "blotch," swimming erratically, then crashing to bottom. Euthanized on 3/15. Platy #3 -- crashed on bottom of tank on 3/14. No visible symptoms except occasional flashing and fin clamping. Came up to eat until 3/19 when she remained at bottom. Died hours later on 3/19. Never any visible problems. Then, all was fine until 3/29 when another platy stopped eating and started hanging listlessly at the top of the tank, then she started hiding and occasionally flashing. She actually has a "sickly" yellow color to her and has her fins clamped. She now seems thinner than before (although it may just be the 4-day fast). On Saturday, another platy started hanging out listlessly at the top and sitting on the bottom, and yet another was swimming and eating normally, but fin clamping and occasionally flashing. The listless one is the only one that seems much thinner than the others, although as of yesterday, he was still eating fine. I have a QT tank cycling, but it is not quite ready yet. The remaining three platies, as of today, seem healthy. After reading all the information on Mycobacteria infections, I am actually considering pulling the three symptomatic ones and euthanizing them. I could not bring myself to do this until I sought your advice. I would hate to put down a fish that could be cured, but I have not attempted to treat the tank yet as I cannot figure out what to treat it for, and I have read your advice not to treat until you are fairly certain with what you are dealing. and, if so, should I euthanize the symptomatic fish in an effort to save the healthy ones (and the two larger fry that are in the tank)? If you think it is something else, is there any treatment you would recommend? Thanks once again for sharing your expertise, and for taking the time to read this lengthy email. You guys are the best. I am at my wit's end, but nonetheless am trying my best to educate myself and act rationally rather than haphazardly throwing chemicals in the tank. It's me again. I took your suggestion and treated my main tank with Metronidazole and Prazi. Last treatment was Thursday 4/5, 25% water change on Saturday, 4/7. The platies have almost completely stopped flashing and appear happier. Thank you. I know that it is very difficult to figure out what exactly what is going on in my tank and you have been very patient with my persistent questions. I am writing again because something happened yesterday that I think may be a clue about the nature of the disease and I can't seem to find anything about it anywhere. I noticed four or five days ago that one of the (always healthy-looking) platies had a spot on her head that looked like she may have scraped it against something. The scales looked a little translucent and indented if that makes sense. Yesterday, that spot had turned black. Like a black patch or smudge. 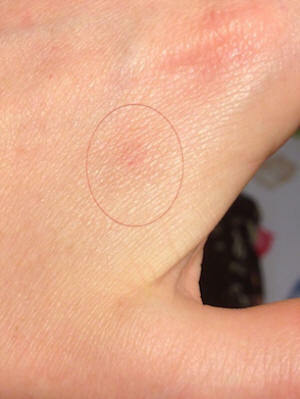 The patch is not raised or bumpy, it is flat with the skin, and does not appear fuzzy. She is acting and eating completely normally and appears pregnant (I can see the black eyes of the fry in her belly). When I saw this, I remembered that the last two platies who died had similar areas of black on their backs, although not as pronounced. Only the tips of their scales in the area appeared black. I noticed the change 10 days or so before they sickened and died. This does not sound consistent with any of the platy disease symptoms I could find discussed in the FAQs. My little 10-gallon tank is finally cycled and ready, so I can pull the affected platy and treat her separately. Does the black patch give you any other idea what might be happening? If not, is it worth treating her with a wide spectrum antibiotic? Is it something that might heal on its own? Thank you again for continually answering my questions. I made another donation to your site this morning. It is something I have been meaning to do for weeks because you have been such a help to me. I wish I had some useful skill to offer in kind, but, alas, I am a lawyer, so I do not. Just a little update on the fish and how they're doing. They've gotten so much better, and they no longer seem panicked or stressed. I do have one more little problem.. The golden female platy in my tank has become very, very thin, and her spine is starting to curve strangely. <Hmm… do suspect Mycobacteria infection… very common among farmed livebearers (including Platies but especially Guppies). Essentially untreatable; would recommend at least isolating, else euthanising. My little sister recently purchased four neon tetra and a fancy guppy for my tank, so to spare her feelings, I had to keep them (and the fact that she threw away the receipt..) Despite the addition of the fish, the ammonia stays at zero, nitrites at zero, and the nitrates at 10-15 ppm. I also got a big piece of Mopani, and I soaked it for five days in a separate container, but it leached more tannins into the water when I put it in the tank. So there are two possibilities for the platy to have the black flecks: contraction of disease from the guppy and tetra, or something from the driftwood's tannins. All of the fish are still doing fine, but I'm just a little worried. The black specks do not protrude or intrude on the body, so it looks like part of her coloration. She is a panda platy, but she is mutated, so she's completely yellow instead of both yellow and black. She originally had little flecks of black around her tail area, but I'm not sure if her coloring is just coming in a little more, or if it's something else, like a parasitic or bacterial disease. There's also the fact that she looks anorexic, and her body is starting to curve a little bit, her back arching up more and her tail curving down. Do you think she could have a disease that's making her so thin and curving her spine? Should I be feeding her any special foods? I feed them all Ocean Nutrition: formula two flakes, which has a lot of protein and vitamins for the fish, and the only one that's getting fat off of this stuff is the baby platy. The momma is starting to get a little bit bigger, but I don't know if that's because I'm feeding her a little more or because her back is starting to arch more. All of the other fish are fine, except that the male guppy loves to watch himself go up and down the glass every other hour, and they're all eating fine. I'm cleaning the tank more often to keep algae from building up, keeping the nitrates lower, etc. I'll have them in a bigger 30 gallon tank by the end of this spring, so I'll just have to work harder on this tank until then. I've read both of the links, and I now realize that the infection may not be treatable, but if I were to try and treat her, what medication should I use? There should be two pictures attached, but I don't know if they will show up. In the first picture, the black specks didn't show up very well, but you could see that her tail is slightly curving downwards and her back is arched more than usual. You could also see that she's very. very thin. The second picture kind of shows the black speckled area near her tail which has always been there, but the new specks that have appeared look like the specks in that area, so again, it could be part of her coloration. <The black specks could be anything. "Black Spot" in pond fish is a parasitic infection, and when it happens in aquarium fish, generally clears up by itself because the parasite can't complete its life cycle in aquaria. Black patches on a fish are more likely to be bacterial infection, dead tissue, defective colouration cells in the skin -- a variety of things. I forgot to mention this, but she started getting thin a little while ago, long before we got the new fish and the Mopani wood, so that excludes the possibilities of the new fish or the wood contracting the disease. I just wasn't very worried then because she was still eating, and she seemed perfectly fine other than that she was starting to get thin. But when her spine started to curve like that, I got a little worried. I probably should have emailed sooner. But she seems to be getting better, eating a little more than she used to and grouping together with her tank mates more, looking a little bit bigger than she was before. <Since Mycobacteria are opportunistic, it is possible for fish to get better under their own steam. Rare, but possible. Treating is difficult. I read in that first link that you can treat the fish three ways: through immersion, feeding orally, or injection. It seems that oral would be the easiest way to treat, since she's gulping down food just as well as the others, but I wouldn't know how to feed her the food with the medicine. I could do it one of the mentioned ways, food mixed in with the jello, but again, I don't know which medication to use. (are any of the medicines listed on that first forum oral medications, or can be used for food?) In the end, I'd probably have to euthanize her, but I at least want to try to help her: she's a very nice tank mate to have and she has a very good temperament. And thank you for the links, and I'm sure they'll be very helpful to me. I'm going to set up a separate 2.5 gallon, using water from the tank to avoid any more stress from uncycled water, and have her in there for a little while, feed her the food, then put her back in the main tank, just to avoid any mess-ups with the water quality in the main tank. I went to the LFS, and they didn't have any five gallons, just 15 and up or 2.5 and below. If I were to feed her the medicine, I will use the gelatin method, blending the food with the medicine and some water, mixing in some gelatin and freezing it. Then I can give her the recommended dose on the box. Well, it's very sad, but I had to euthanize the fish. It ended up coming a day late, and my fish was completely degraded, wouldn't even swim up for food. But she's been put out of her suffering, and since the suspected fish TB is still in my aquarium, I'll be able to use the medicine for any future confrontations with the disease. I had a little mix up with the angel and the younger platy, though. I had come home from my classes and all of the fish seemed okay, I fed them, and left. But I came up about an hour later and I found (for the platy's size) a rather large lesion a few centimeters behind the right eye. I'm surprised it didn't go for the guppy or any of the neon tetra first, though. The wound looked just about the same size as the angel's mouth, so I guess we have a culprit here. There's no sign of stress or any fungus growing on the wound, but I don't really want to waste any time that I could be using to heal the wound. I'll look into this "bio-bandage" stuff, but I'll need some more options. Thanks for all of your help, though. I'm sure that the platy will be fine, but I'll just have to wait and see. I'm thinking it was partially the neon tetras, too, because they were lightly picking at her before I separated the injured fish from the rest. I guess they kind of "cleaned" her of the dead/dying tissue, so that could have helped prevent any rotting on the wound. (hoping that it wasn't painful for the poor fish..) I've bought a tank divider to separate them while the fish heals, fits snugly so none of the other fish, especially the angelfish, can get to her. Hi, I have searched Google and your website and can't seem to find anyone who has had the same symptoms as my two gouramis currently have. We have a 250 litre tank with 2 gouramis, 5 mollies, 2 silver sharks and 1 angel fish. The water levels are all fine. We have recently treated the tank for Ich (approx 3 weeks ago) and now all the other fish seem fine, except the gouramis. Our rainbow fish died today and when we removed it from the tank we found that the gouramis had been hiding in the plants (plastic). When we disturbed them by removing the rainbow fish they came out and we noticed a White patch on one of them and both of them appear to have a rotting top fin and swelling on their heads. They seem to be clamping their side fins too. I can't see any problems with and of the other fish. I haven't come across this before but they really don't look well. I have attached a picture below. The big White area is on the fish behind and is quite blurred but you can clearly see the White areas on the one at the front. This also looks as if the skin is shedding/peeling. Do you have any idea what this could be? first of all, Id like to thank you guys for running this website its helped me out many times and its always my first stop when there is something wrong with my fish and I need an answer. I have a tropical fish tank with a mix of loaches, Platies, a Cory, and four (or, as of yesterday, three) zebra Danios. I feed them mainly with fish flakes and some additional sinking food for the loaches. I cant recall how big the tank is, but from previous calculations I know that it isnt overstocked (since I had a few deaths recently its rather a bit under-stocked, but more of that later). As for food occasionally they get bloodworms or daphnia but they havent had much variety recently because we were on hold for a few weeks and its easier for the fish feeder to just give the flakes. Now, to give you the back-story. I have to admit that in recent months Ive been a very bad fish keeper indeed. I am pregnant and the constant exhaustion and nausea has thrown me for a bit of a loop, meaning that Ive been less than diligent with cleaning out the tank. Add to that that every time I clean it I seem to have to flush a fish or two afterwards (is it the shock of all that clean water?) and tank maintenance hasnt looked too appealing recently and the tank has on occasion looked pretty bad. Through this neglect I have lost a few fish recently, but there was nothing in particular about those deaths that alerted me to anything like an illness fish would stop eating, keep themselves separate, and eventually die. There were no sores, discolouration or anything else odd. Losses were varied an aquatic frog, a couple of guppies, a Cory, and some Platies, but with many weeks in between). Its bad, I know, and I feel rather guilty, but I attributed it to the bad water quality and tank hygiene rather than any disease. Now the Danio A while back (at least a month or so ago) he developed a curved spine. Looked really odd, like he had a hunchback or something like that. Initially this didnt seem to bother him much at all, but during the past week or so he got slower and stopped swimming around much. Eventually I found him at the bottom of the tank, kind of crumpled up he looked almost paralysed, his spinal deformity looked that bad. He wasnt moving and I thought he was dead, but when touched he roused himself and swam off. The next morning I found him floating at the top of the tank, dead, but get this by the time I got round to fishing him out (had to get kids off to school, etc, so it was a couple of hours later), he was gone! This was two days ago and Ive done two water changes since and I havent found him. Perhaps he was eaten?! Granted, I have a lot of plants in there, but I did check through them and nothing! Since he died in such an odd way, today I sat down to Google the hunchback syndrome and after reading about Fish TB for a couple of hours I am more than a little freaked-out, in particular as it can be passed to humans. As I said, I cleaned the tank twice in the past two days and I did discover a little wound (cuticle) on my hand, so that wound was definitely in contact with the water! In particular as I am pregnant Im rather worried that I may have contracted something... Do you think it is likely the Danio died of Fish TB? He didnt appear to have any sores, etc. that I could detect, but then, that appears to be optional. He was quite big and I think I must have had him for at least 1.5 years so perhaps it was just old age? Or it was the dismal conditions that the tank was in for a while? I have today discovered that another of the remaining Danios has a slightly curved spine, although not nearly as bad as the one that died. He is also a rather large (so Im guessing one of the older) Danios. So far he seems fine otherwise. What is your opinion? Fish TB? Old age? Bad water and nutrition? Or some other weird and not so wonderful fish problem? And should I go to the doc to get this TB thing checked out?! Any help would be much appreciated. Thank you!! I've emailed your fantastic team over this sick fish in the past. Although I've successfully halted most problems my female Panda Platy over the past few weeks, it appears that the fish TB (Mycobacterium) is taking hold now. She developed fin rot and has stopped eating. I put her into a hospital tank where I do a twice daily water change and put it some liquid vitamins. I treated the fin rot with some salt and JBL Ektol Fluid for two days and the rot appears to have stopped. I gave her two days free from meds and she appeared to be swimming fine albeit with a wobble now. She hasn't eaten for a week and is now looking painfully thin. Is it now time to put her out of her misery with some clove oil? She appears to be happily swimming about so I don't want to deny her a few last days if you think she is not in pain. However, if you think that this is unkind, please tell me and I will perform the euthanasia as soon as. Finally, will I need to strip down all my tanks? She has been in all of them for one reason or another. The other fish all appear fine and I have read that there could be up to 25% of all fish sold commercially with TB. Any advice? The evidence for the fish MB is as follows for me. I've had my tanks now for nearly a year. The shop that sold me my first batch of Panda Platy's finally admitted they had something wrong with the fish/tanks when I complained after they kept dying. They all wasted away pretty fast. The only one to survive was one Panda Platy despite having a curved spine. About seven months down the road, she started to show a lump and strange flaking on her tail (almost like dropsy). After communications with Neale (he wasn't sure from the pictures I sent), I decided to try a 30mins bath in JBL Furanol 2 antibiotic and it appeared to help. She did well in the main tank again for a few weeks but then became shy and stopped keeping food in. I also noticed she had developed fin rot and was looking painfully thin. This is when I moved her to a hospital tank and treated her with JBL Ektol Fluid. The fin rot appears to have stopped but she just now wobbles at the bottom of the tank and appears very very thin and weak. I have indeed read the page you suggested to me, thank you. I understand that the JBL Furanol 2 does not treat MB. Is there anything else I can do? The water in the hospital tank is being changed almost twice a day although due to her lack of eating, the ammonia and nitrate levels are pretty much zero. I'm not sure whether I will be able to get it checked out via microscope, I'll have a think on that one (I am a doctor of music, not medicine unfortunately in this case). Should I be able to tell from a water sample? If I find anything, I'll come back to you. That's great. Thanks. I'll try and make Platy's life as comfortable as possible as there appears to be not much more I can do. A quick question on tank maintenance if I may take one further minute of your Sunday. My tanks are pretty heavily planted and I have a JBL Manando substrata with some white sand that has since become rather dirt coloured. but there always appears to be so much waste left behind (when I change water it stirs up in the tank for a good hour). I've searched the net for ages and found nothing much more than others advising not to bother, the waste will act as a fertiliser for the plants. Hello from the UK. I will try to keep this brief. Have a 720l freshwater tank, which I intend converting to a marine FOWLR. Plan was to give most of the fish to a mate, and sell the rest. add new water and bring SG up to 1025. Leave for a week, then add 75kg of live rock and leave to cycle for a month. After this slowly add stock. Unfortunately after a few deaths, diagnosis from a vet. Mycobacteriosis (fish TB) and to euthanise all stock, which is sad as I have had some of these fish for seven years. Anyway back to my question, do I have to do anything specific to rid my system of this bacteria, or will the simple addition of salt sort it out. Hoping your countries impending loss in the Ryder Cup does not affect the advice you are going to give. Many thanks, Paul. Re fish TB- Hello again, from a citizen of the continent who now holds the Ryder Cup. Thanks for the info, will chuck gravel and replace with sand. I'm also checking out the media you mentioned. Was wondering at what temperature these Mycobacterium perish at, and if there would be any point in heating the empty tank up to and over this temp. A quick question on the grisly task of disposing of a tank full of what looks like perfectly healthy fish. I intend using clove oil, unless you can advise me of a better method. I've attached a photo ( sorry about the quality but I believe it shows what I am talking about) of my Rasbora trilineata. I have had him for 1 month and slowly I have noticed his spine in the caudal region has become bent. Until now I believed it to be a birth defect that merely became more noticeable as he grew. <Indeed. Well, it's untreatable but unlikely to spread, so would remove/euthanise this fish, but otherwise not worry over-much. I have "trained" the fish to eat when I signal them so I can observe them eat. For the past 3 days he has stopped eating even though he comes when I signal, he does not eat. I have moved him into a quarantine tank to isolate. He was in my 90 gallon tank with 5 neon tetras and 2 other Rasbora trilineata. All added without quarantine as they were held in the same tank together at the store for me for one month while my tank fully finished off cycling ( I don't add until Nitrates are low and or algae is present). Cycle was done using a fishless method with a grocery store bought and rinsed shrimp in a rinsed stocking. I did not know fish could carry TB until I came across a FAQ by Don and I am alarmed by the symptoms similarities. <Fish TB is actually extremely rare, particularly among freshwater fish. While his trunk does not appear to be swollen compared to the others his sudden loss of appetite and elusiveness are setting off alarms. If the most prudent plan of action would be to put down the animals, what is the most humane way to do this and also to dispose of the bodies without contaminating anything else. If this does not seem to be TB what are my next steps. Ammonia and Nitrite are 0 and Nitrate is 10 ppm. Lush bright green algae on sides and back. I do 30 gallon water changes once a week. Filtered with Aquaclear 110. The substrate is Eco-Complete plant substrate one inch thick across entire bottom. Temp 76F pH 7. Two Maxi-Jet 1200's for water movement. One bubble wand for oxygen. No Co2 injection. For lighting I use Corallife 96 watt 6700k bulbs. Quarantine tank is a 12 gallon nano cube that has been stripped down to have a sponge filter and is cycled. Long term plan for this tank is heavily planted without co2 only using common low light plants. Any advice is welcome I work with the public and can not risk carrying/having/spreading TB. Thank you so much for your advice. I think I will take the fish to a vet to be euthanized and possibly get them to run some tests on it to make 100% sure. Although I no longer believe TB is an issue I figure it can not hurt to make certain. I feed TetraColor tropical flakes by Tetra and have decided to include frozen bloodworms to mix up the nutrition values. While I have your ear I would like to run a short stock list to be added no sooner then a month from now. Hopefully then I will be sure there are no pathogens, odd chemistry or poor nutrition taking place in this tank. I want to add in this order. Do you think the TSAE will stress the hatchets out too much? My tank is covered with eggcrate but I still don't want them freaking out. I am unsure of what will come after but I believe I am pushing the stocking limit of my tank. They will be added in family groups as to keep the load on my quarantine tank low. Also how long should I allow my quarantine tank to sit fallow before I can quarantine more fish? In closing I have to thank all of you for the knowledge that has accumulated on this site. Neale has helped me with other tanks in the past that have absolutely flourished. Another invaluable article on tap water preparation, storing and polyvinyl has saved me oodles of money/livestock. I have even earned a free True Siamese Algae eater through helping my LFS separate their Flying Foxes, False Siamese Algae Eaters and their True. Much of my success I owe to this site. I wish I could remember all the authors of the various articles I have read that have made me very skilled at aquatic husbandry. Also I would like to urge my fellow aquarist to get out there and shop the local mom and pop fish stores. They do not seem to be doing well with the economy, mega store and online competitors. More Bent Spines I currently have a dozen Platy fry and I'm wondering about some physical deformities. We had 11 babies from 2 females just days after getting them from the pet store (so obviously not from my male). I raised them in a 2g tank, and then found a new fry about 5 weeks later in the big tank and moved him in as well (he was newborn... the rest of his batch got eaten or sucked into the filter). I had a new female in a QT tank for a few weeks, and as soon as she was moved to the main tank I separated my babies into 2 tanks (both 2g). I thought maybe they'd grow faster. The first 11 are approx. 9 weeks old now, and still seem pretty small (too small to trust with my adults in the main tank). So my first question is am I stunting their growth somehow? Is the tank too small for all of them?